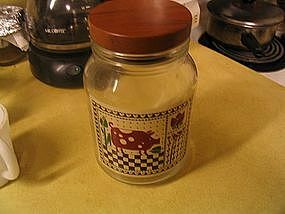 Anchor Hocking canister or storage jar manufactured in 1981 and is the 64 ounce size. It has a wooden lid with a rubber seal. There are no chips, cracks or breaks to the glass jar. The enameling is intact. If you have any questions regarding this item, please email. I need your zip code to calculate the postage.